Thanks to your sharp advice, insurers and pension funds remain on time and ready for the future. You have the knowledge to take on the constant challenge for pension funds and insurers: stay up-to-date. Thanks to your sharp advice, insurers and pension funds remain on time and ready for the future. You have the knowledge to take on the constant challenge for pension funds and insurers: stay up-to-date. With ever-changing laws and regulations, volatile financial markets and social developments. Do you also know how to translate your expertise into clear and applicable advice? Then we would like to meet you. What does your work look like? You determine that for a large part yourself. Because at PwC Pensions, Actuarial & Insurance Services (PAIS) you can choose the roles that suit you. Maybe you will help an insurer with the implementation of new laws and regulations. You will make the risks of a pension fund transparent. You assist the selling party in a due diligence process. Or you participate in a pitch for PwC. Whatever you do, you work in a team of high-level specialists. Together you translate the global demand from customers to a concrete proposal, in which different expertise and backgrounds come together. With each project you not only look at the current issue of the customer, but also into the future: what goals have the CROs or CFOs set for the organization, and how do they want to achieve this? The duration of projects varies: sometimes you work on the same assignment for six months, sometimes time is running out and you have to be in top gear for a while. Occasional overtime working is part of it, but you can always catch up with your free time later. Your professional knowledge is of course good, but you also feel flawlessly what role customers expect from you. Whether you are in front of a C-level specialist or a pension fund participant who knows little about risk, you adapt to each situation effortlessly. You also have a keen eye for new business opportunities. Not only because you like to receive orders, but also because you want to help your client even further. In short: knowledge, empathy and commercial strength. We are searching for this combination. You speak and write excellent Dutch and English. Note: at the first step of your application you have the option to add your CV, then you can upload your other documents in the third step (Grade lists of your high school, Bachelor and Master). 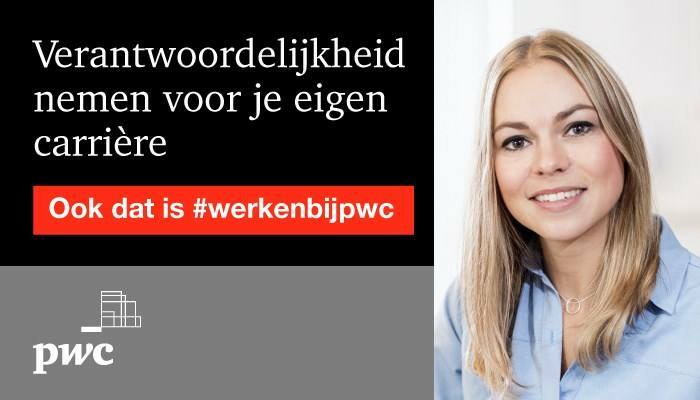 Please send your application for Riskmanager pensioenfondsen/verzekeraars at PwC in Amsterdam including your resume and cover letter via our website.